By simply filling in the blanks you will create a life-long treasure for your child. Filled with Mary Engelbreit's colorful, whimsical illustrations and quotations this journal is simply irresistible! Mom's can record information about grandparents, as well as great-grands. There is a section for Mom & Dad's childhood memories and their times together before baby. Record your pregnancy and birth memories. Then, of course, detail your child's development up through high school and your hopes and dreams for your precious child. Makes a beautiful heirloom and family keepsake. I have 4 children and this mothers journal is the best way to capture their memories. It has all family history plus many personal touches! I use it to write random events , sayings and photos. 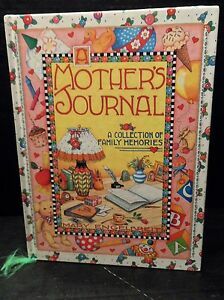 I have 4 of my own of these journals and I try to find them on ebay any time I can for expecting friends and family members since it is no longer in print! Also, Mary Engelbreit has colorful and whimsical illustrations! the book was of excellent condition, the graphics were very cute and attractive, pleasing to the eye. the inside wording and pictures for the mother to fill out were of fine quality. the questions that you fill out are of perfect wording for the mother to answer for the child to read when they are older. I would buy this book again for anyone having a baby shower it is a great gift for the mother to be and her child. Beautiful way to record one's memories. A wonderful and heartfelt way to record one's memories for future generations. I would recommend this to any family historian. Thank you for making it easy to write my memories down. A wonderful keepsake for your little one that goes beyond the typical "baby book" with more indepth comments and subjects. Geared toward mom of course (just see the title!) - i wish i had a matching one for dad!